the pink toque. a craft blog: Mmm... Asparagus? 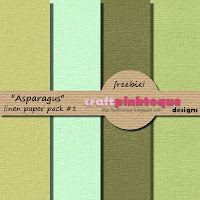 I don't really have a special love for asparagus or anything, (though we do have an inside joke about it) but the name seemed fitting to describe the colours of the paper pack freebie I have for you tonight! You know how I mentioned yesterday that I had a bunch of freebie ideas rolling around in my head? Well this wasn't one of them, but I got suckered into trying out blends in Photoshop (yes, I said Photoshop... I have been using Paint Shop Pro faithfully all this time and kept resisting the move into Photoshop, but... alas it has suckered me in.) and somehow these papers came to be. This is paper pack #1 of the "Asparagus" colour scheme (in high quality 3600 x 3600 pixels and 300 dpi) and tomorrow I'll throw up paper pack #2 for you :) The first pack here is all a linen texture and in the second pack I tried messing around with blends and different overlays. Not too bad for my first items in Photoshop! I've made a couple elements that go with all of these papers but I'm not done with them yet. Look for them sometime next week! I have a little knitting and stitching themed kit that's nearly done, too -- done mostly in Paint Shop Pro with one or two items that used the help of some of the capabilities of Photoshop. I think I'll be using a little of both from now on, at least until I get used to everything in PS. There are some things I can do in PSP that I haven't quite figured out in PS so there will be a lot of switching between programs until I feel comfortable. I'm pretty excited about some things I learned today and I even started on a mini kit (resulting from some PS experiments with my favourite shades of pink!) that I'll eventually finish for those of you out there that love pink as much as I do. So many kits on the go and so many more ideas bouncing around in my head that I want to make! There just aren't enough hours in the day.